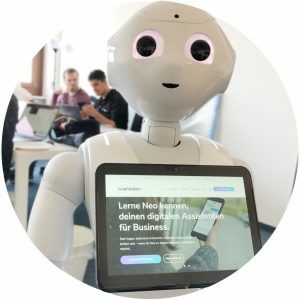 Enable business use-cases on Pepper robot with Neohelden's AI-platform: Pepper, powered by Neo! 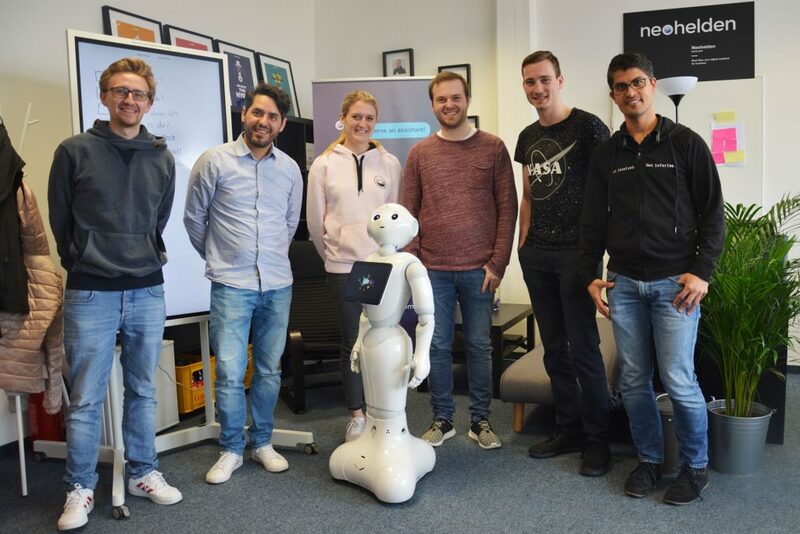 With Neohelden's Conversational Platform, Pepper can assist employees and visitors. Our digital AI-assistant Neo supports employees in their daily work with software and tools – thus far via an application for smartphones, tablets and PCs. 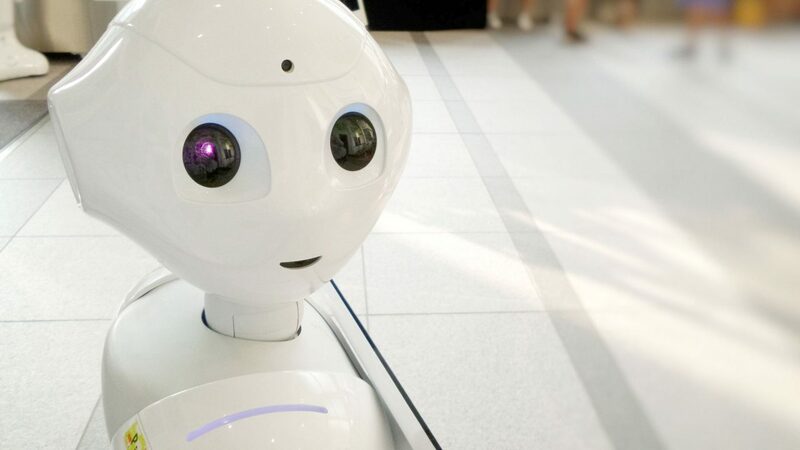 Now, however, Neo runs on the interactive robot Pepper: You can talk to Pepper, and access Neo's integrational framework and AI-platform in the backend. Pepper-robot comes with a broad set of features: It is equipped with face-detection, some fancy dance-moves and sentiment analysis. However, if you were to connect Pepper to your APIs and software-tools, it gets a bit tricky. This is where our Neo-Toolsuite comes into play: Using our integratinoal framework and intuitive drag&drop conversation builder, you can model complex use-cases and interactions, which can then be used by talking to Pepper. Hey Pepper, what is Softbank's current stock price? Hey Pepper, tell me some news! Hey Pepper, what's my budget? To access enterprise systems like SAP, Oracle, or Salesforce through a digital assistant, you'll firstly have to identify and define use-cases that add value for users. For these specific use-cases, you'll then create and train a language model, so that the assistant is able to understand your request and queries. By extracting the user's intent from natural language queries, our algorithms "translate" them into technical actions, which can then trigger workflows and conversations. Our Neo-Toolsuite allows for easy configuration and customization of Pepper's future functionalities. You can create and train language models using an intuitive user interface and extract intents and entities from user queries. These intents can then be processed using a Drag&Drop conversation builder to integrate relevant third-party systems and enrich the answers, which are eventually presented by Pepper to the user. What's the stock price of Apple? This stock-quote-„intent“ will then be processed within the Neo Flow Engine: We're integrating a trading API to request current stock prices, in order to generate a response to the user's query: „The stock currently trades is at $151“. Using our existing Enterprise-platform, Pepper gets ready for the business world – beyond trade fairs and event stages! If you wish to employ an intelligent and smart Robo-employee in your company, we're happy to demo our platform and are awaiting your request!